Imagine waking up every morning not only looking forward to your work day, but looking forward to the environment in which you work! Welcome to Link Park, an integrated work place in which culture, community, and productivity are intrinsically linked. Situated on 42 acres at the crossroads of three major interstates, Link Park serves as a gateway to the Greater Binghamton business community. The first office space of its kind in the area, Link Park provides the technological infrastructure to support global businesses, as well as the cultural foundation to support the hiring – and retaining – of world class employees. 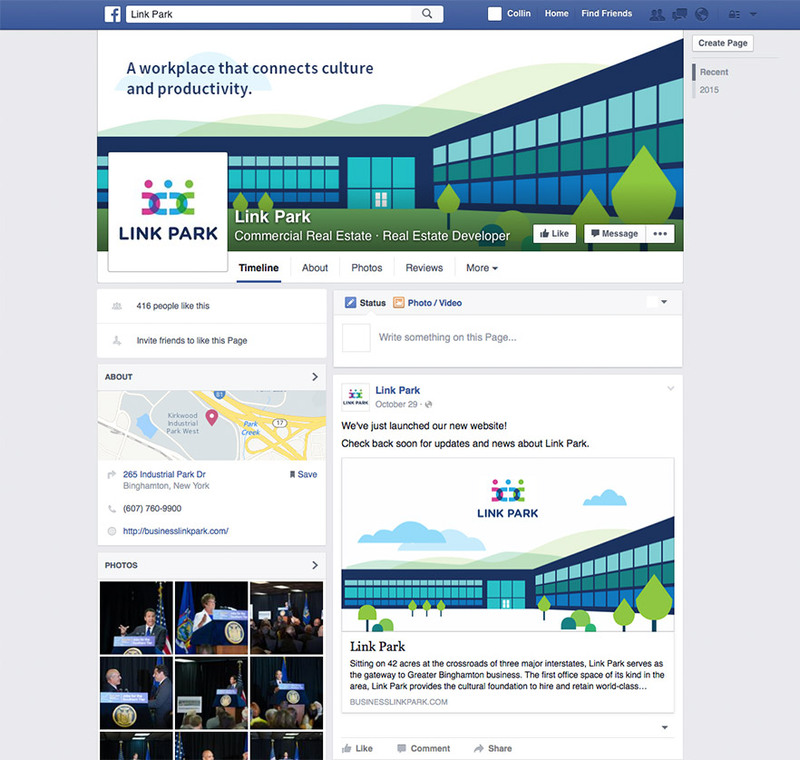 Link Park’s new identity needed to communicate the synergy of innovation and culture, coming together with an extraordinary and unique work environment that powerfully supports creativity and productivity. Idea Kraft created a logo that captures the essence of Link Park, a multi-faceted work environment that brings together employees, companies, and customers with local culture. In order to portray this spirit of collaboration and interconnectedness, Idea Kraft employed an invigorating color palette and modern typography in a simple, but fun design. The strength and energy of that design then ignited multiple ideas for environmental icons, patterns, and illustrations to be used throughout the Link Park complex. Ewelina and the team at Idea Kraft define the word PARTNERSHIP. They challenge and teach us. Together, we learn, design, brand & package all kinds of ideas into a finished “product” that inspires year-over-year growth and pride throughout our entire organization.